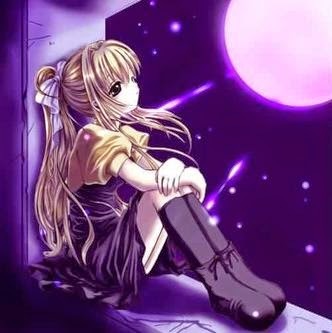 Caroline Thanh Hương: Bộ ảnh 74 tấm về tiểu sử, trường và ngôi mộ Petrus Ky.
Kính gửi quý anh chị bộ ảnh gồm tiểu sử, hình ảnh trường và nơi yên nghỉ của ông Trương Vĩnh Ký. Chân thành cám ơn tác giả những hình ảnh và nhạc được đưa vào show hình này. Trường hợp những slides dưới đây theo thời gian bị biến mất, quý anh chị có thể tìm lại coi theo đường dẫn dưới đây. at Does The Future Hold For Petrus Ky’s Mausoleum And Memorial House? 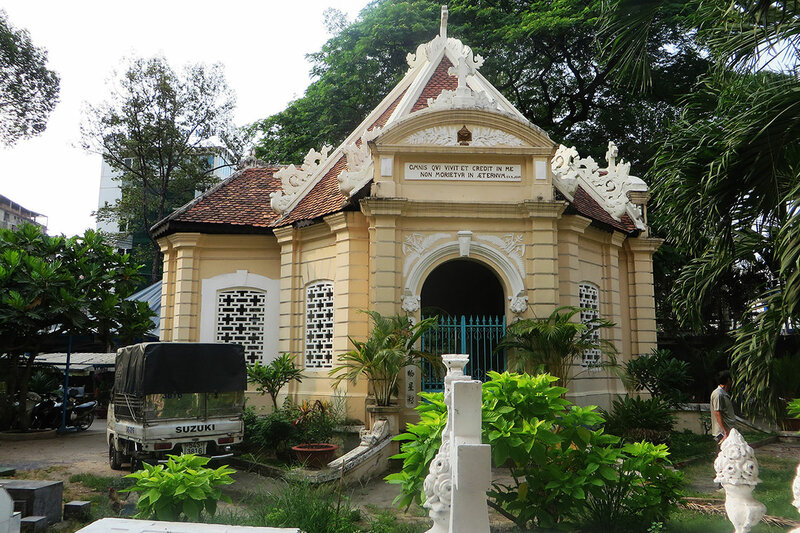 Not yet recognised as a heritage site, the Mausoleum and Memorial House of Pétrus Ký, one of Việt Nam’s greatest intellects, has fallen into a state of disrepair. 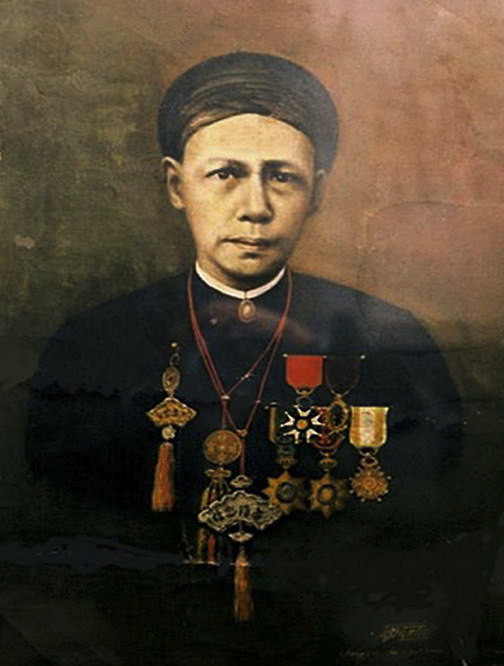 Jean-Baptiste Pétrus Trương Vĩnh Ký (1837-1898) is widely recognised as one of the greatest Vietnamese scholars of the 19th century. Jean-Baptiste Pétrus Trương Vĩnh Ký (1837-1898). Having initially trained for the priesthood, Ký was employed in the early 1860s as an interpreter by the Société des Missions Étrangères de Paris (MEP). He later entered colonial service, becoming professor of oriental languages at the Collège des Interprètes, the École normale and the Collège des administrateurs stagiaires in Saigon. Said to be fluent in at least 10 languages, Pétrus Ký left a remarkable legacy of over 100 works of literature, history and geography, as well as various dictionaries and translated works. He also wrote grammar study books on a wide range of oriental languages, including Chinese, Khmer, Lao, Malay, Siamese (Thai), Cham, Burmese, Tamil and Hindustani. As early as 1873-1874, Ký was cited by the Grand Larousse du XIXe siècle encyclopaedic dictionary as one of 18 world-famous writers of the 19th century. Ký was the editor of the academic journal Miscellanées and helped lay the foundations for the development of Vietnamese-language newspaper journalism. After his death, Pétrus Ký was buried in the garden of his wooden-framed house in Chợ Quán which he had built in 1861. 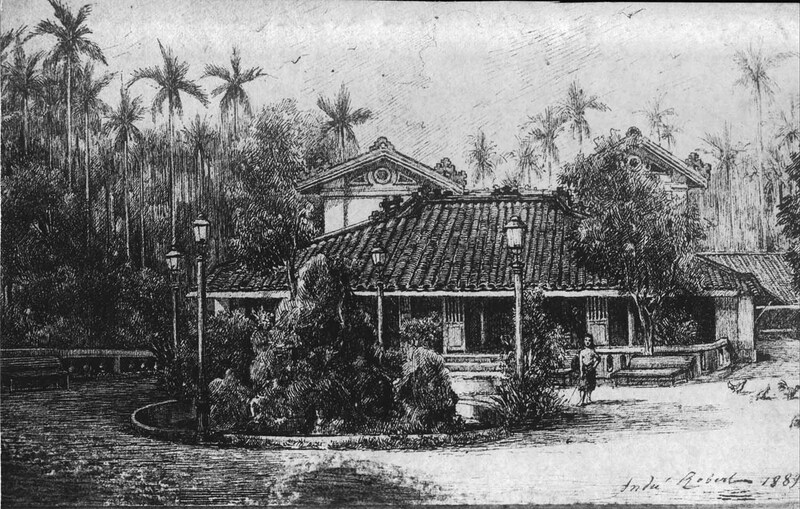 Pétrus Ký's house in Chợ Quàn, drawn in 1889. In 1927, a bronze statue of Pétrus Ký by French sculptor Constant Roux was unveiled in the park behind the Saigon Cathedral. Then in 1935-1937, as the centenary of his birth approached, the Société d’enseignement mutuel de la Cochinchine built a western classical-style Mausoleum in Ký’s honour, enclosing his grave. During this period, his old wooden residence was restored and transformed into a Memorial House. Since 1975, the Memorial House has been occupied by two families, and in recent years a café has been installed in the Mausoleum grounds. 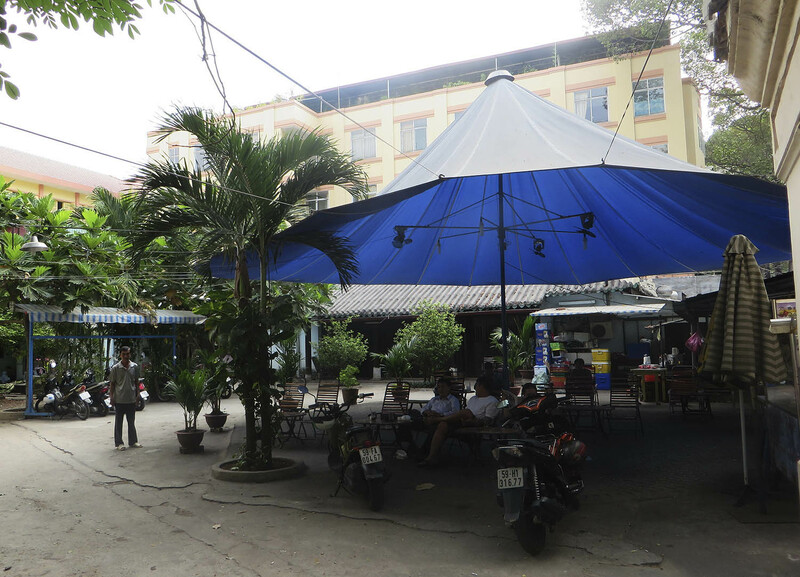 The same view of Pétrus Ký’s house in Chợ Quàn today, with a café blocking the view. After Reunification, the Pétrus Ký statue behind the Cathedral was removed, but it has survived intact and currently stands in the rear compound of the Hồ Chí Minh City Fine Art Museum. The remains of its plinth, which suffered extensive damage during removal, are now stored in the front garden of the Hồ Chí Minh City Museum. The damaged plinth of the Pétrus Ký statue is currently stored in the front garden of the Hồ Chí Minh City Museum. Over the past few years, the Pétrus Ký Mausoleum and Memorial House has become an increasingly popular destination for foreign visitors, due to its historical significance and the quality of its ancient architecture. In particular, the 154-year-old Memorial House is now one of the oldest surviving traditional-style houses in southern Việt Nam. However, the site has not yet been recognised by the Vietnamese authorities as Municipal or National Heritage and is currently in poor condition. 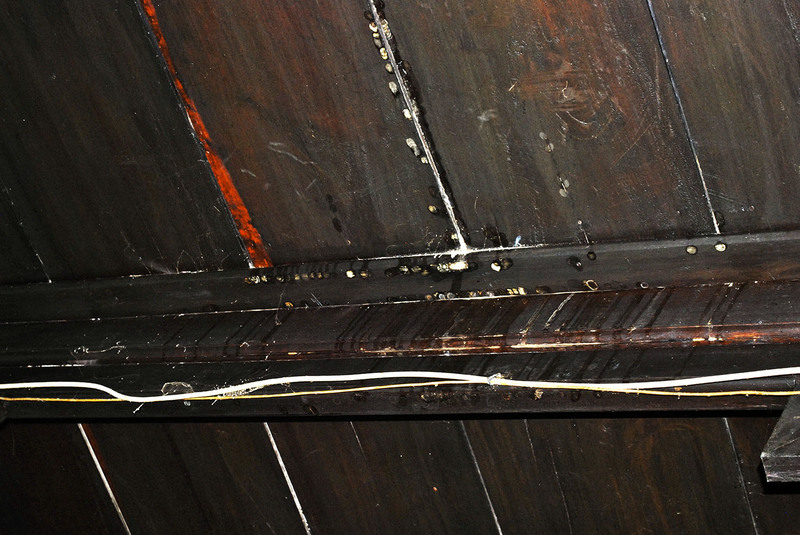 Moisture and mould has also damaged the wooden house frame. 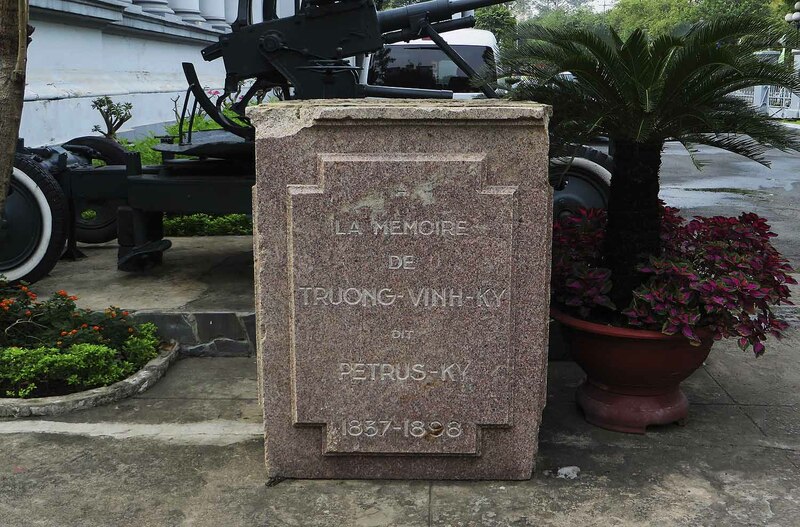 Speaking for one branch of Pétrus Ký’s family, great grandson Richard Trương Vĩnh Tông, who lives in France, pointed out that the wooden frame of the Memorial House and the roofs of both buildings have suffered serious damage from moisture and mould and are in urgent need of repair. Many antique tiles have been broken or displaced, encouraging further water infiltration. The walls of both buildings and the outer wall of the compound also require urgent maintenance. 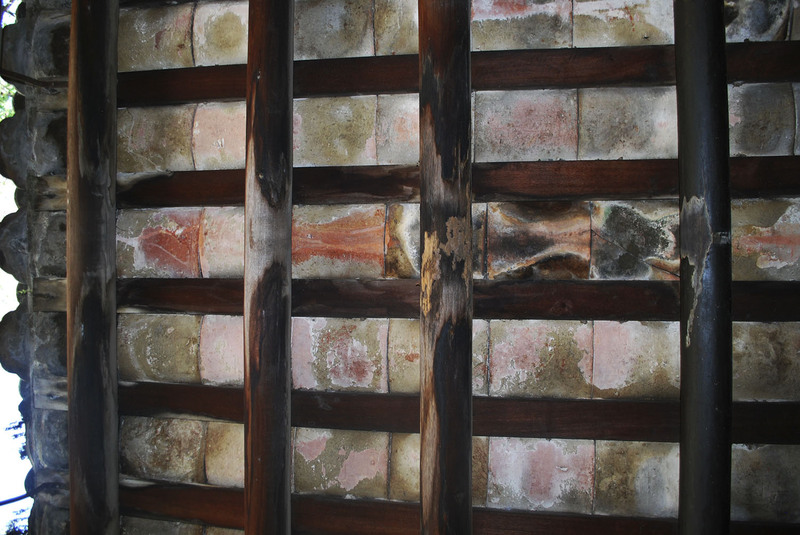 The Mausoleum and Memorial House roofs have both suffered serious damage from moisture and mould. Legal documents passed down by Richard Trương’s grandfather Nicolas Trương Vĩnh Tông (the youngest of Ký’s nine children, who died in France in 1974) show that the “usufruct” rights to this site were granted to family members only for hương hoa (ceremonial offerings for the purposes of ancestor worship), and not for the purpose of residence. A royal honour awarded to Pétrus Ký by King Đồng Khánh is in poor condition. Over the years, overseas family members have contributed generously to the upkeep and repair of the compound, but its current lack of heritage status makes it difficult to prevent inappropriate usage. Richard Trương believes that recognition of the compound as a Municipal or National Heritage Site could not only afford legal protection but also make it possible to develop the Mausoleum and Memorial House as a visitors’ centre where cultural tourists can learn about the life and works of Pétrus Ký. Such a scheme could include the relocation of the 1927 bronze statue of Ký to the Chợ Quán compound. Pétrus Ký made an important contribution to Vietnamese scholarship. It is to be hoped that a way can be found to preserve his Mausoleum and Memorial House as a heritage site for future generations to appreciate. Tim Doling is the author of the walking tour book Exploring Hồ Chí Minh City (Nhà Xuất Bản Thế Giới, Hà Nội, 2014) and also conducts Heritage Tours of Saigon and Chợ Lớn - see www.historicvietnam.com. Phan Hạnh viết Lính Nào Chẳng Nhậu.